A plaque erected in 1929 by the congregation of the Canobalas Methodist Church (1872-1973) commemorates Joseph and Agnes Hicks. The plaque was transferred to Orange in 1974. On a recent Sunday, a service of dedication of memorials to late Mr. and Mrs. Hicks, was conducted in the Canobolas Church (Orange Circuit) by the superintendent minister (Rev. C. A. S. Woodhouse). These pioneers of the district lived opposite the church for 70 years. 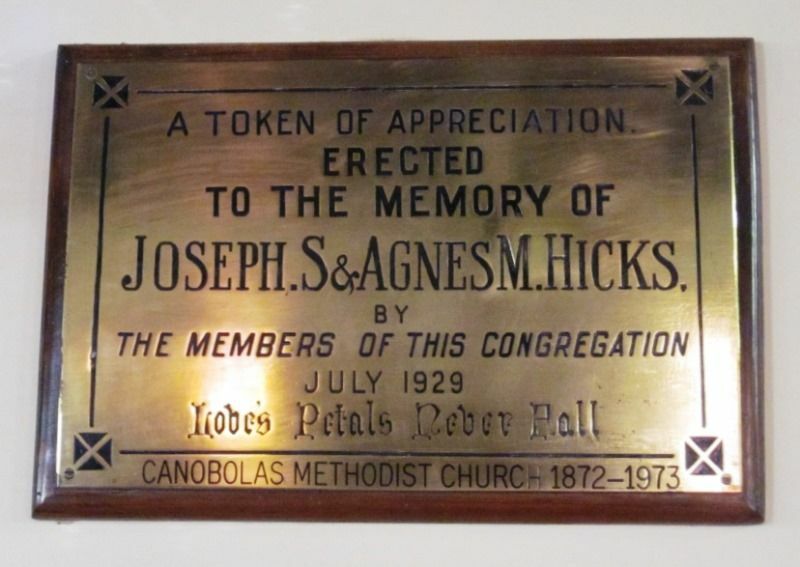 Their family have recently donated, a fibro-plaster ceiling, and the congregation erected a brass tablet bearing the following inscription: — ''A token of appreciation to the memory of Joseph J. and Agnes M. Hicks. Erected by mem bers of the congregation. July, 1929. Love's petals never fall." The senior circuit steward,, Mr. S. T. Lamrock, unveiled the tablet, and paid high tributes first to Mrs. Hicks, an ideal wife and mother, and a self sacrificing worker for the church, and to Mr. Hicks, for many years treasurer of the trust, and a most generous supporter of the Methodist Church and institutions. To Wolaroi College, he gave material assistance. Mr. Lamrock congratulated the members of the family on placing in the old church of their parents such a beautiful and useful memorial college. Rev. C. A. S. Woodhouse in his address, said: "This ceiling is the gift of the Hicks family, in memory of their parents, who for so long worshipped within these walls. The renovations, not quite complete yet, have been made possible by your united gifts and this memorial tablet has been erected by the trustees in memory of this man and this woman, almost against the wishes of their children, as a mark of their esteem and appreciation. On their behalf and yours, I am to pay a reverent tribute of admiration and affection to these two, who endeared themselves to so many by the sweetness and sincerity of an unobtrusiveness and sincerity of an unobtrusive devotion to God and this church, and who are not, because they have passed to higher service." In a few appropriate words, the gifts and renovations were dedicated to God in prayer. Methodist (Sydney, NSW), 17 August 1929.